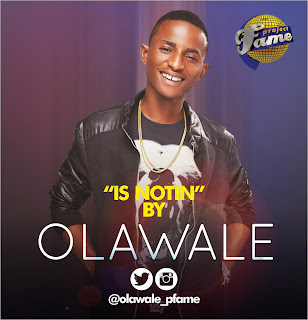 Having been crowned the winner of the latest season of MTN Project Fame West Africa and spent the last three months evolving his sound and honing his craft as an artist, fast-rising Nigerian Pop sensation and musician OLAWALEis proud to debut his brand new single titled “Is Notin”, produced by DJ Klem. Premiered on several leading radio stations across the country including Cool FM, Wazobia FM, Beat FM, Rhythm FM and Naija FMearlier today, “Is Notin” sees both Olawale andDJ Klem in flying form from start to finish - from Olawale’s sweet voice to his infectious flow to DJ Klem’s up-tempo musical milieu backed by lush drums and guitar arrangements, it is hard to sit still once this massive Pop record comes on. Currently in his final year at Ladoke Akintola University studying Agronomy, Olawale also serves as the musical director of his university’s church choir and draws his influences from the likes of Tiwa Savage, Bruno Mars, Neyo, J. Moss and Deitrick Haddon. Beating out fifteen amazing artist, he joins the likes of Iyanya,Chidinma, Monica Ogah and Ayoola as the sixth winner of the prestigious MTN Project Fame talent show.